Be sure to stop by our booth at next week’s ISC show for a demonstration of our new solution for full programming on Honeywell VISTA panels! As you know, DMP’s CellCom universal alarm communicator provides ECP communication with Honeywell VISTA panels, giving those customers the ability to arm, disarm, and manage their user codes, all through the industry-leading Virtual Keypad™ app. Next week, we’re excited to show you how we’ve expanded that technology delivering full panel programming. Don’t miss our introduction of the new DualCom Dual Alarm Communicator that can be connected to a Vista series ECP bus, and with Remote Link™ Version 1.92 gives you the ability to program the Honeywell panel remotely using Honeywell’s Compass downloading software. 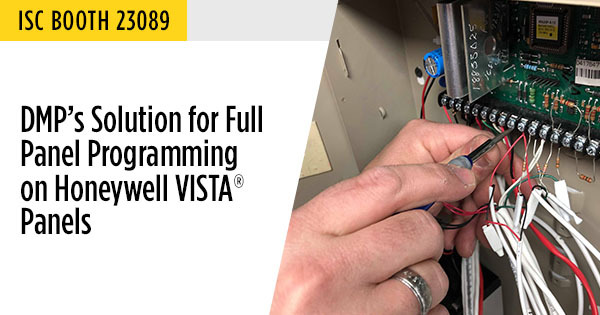 By selecting ECP Passthrough on Remote Link version 1.92, you’ll have the ability to communicate with COMPASS software, which will connect it to the appropriate panel for full programming. "This is an exciting upgrading opportunity," says Aaron McGhee, product manager for DMP control panels. As before, your customers will have the flexibility to use their Virtual Keypad apps for the ultimate convenience in managing their systems. For questions or more information, please contact one of our Inside Sales representatives at InsideSales@DMP.com or 877-757-4367 or one of our Tech Support technicians at TechSupport@DMP.com or 888-4-DMP-TEC (888-436-7832).